Many of the Windows enthusiasts have already installed Windows 7 in dual-boot with XP or Vista and some of them have even installed Windows 7, Vista, and the good old XP in triple boot. After installing Windows 7 with Vista or XP, many users might want to change the boot settings. Although one can find basic boot configuration settings in Windows 7’s System Configuration utility (type msconfig in start menu & hit enter to launch it), many users might want to edit the OS name in boot menu, or add/remove an OS entry and more. As playing with Windows 7 bootloader is not an easy task and also not recommended, we have a cool tool to share with you that enables you edit Windows 7 boot settings easily. 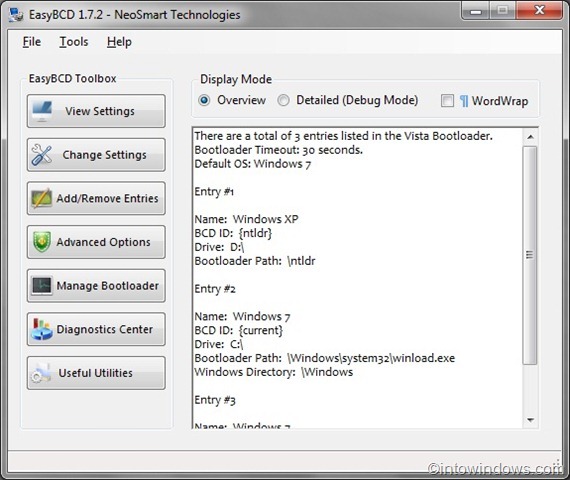 EasyBCD is a free utility using which one can edit and play with Windows 7 boot settings in a few seconds. 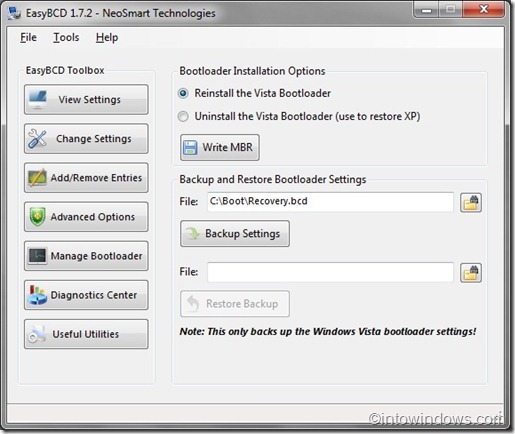 This easy-to-use tool lets you view bootloader settings, change boot settings, add/remove OS entries in bootloader, reinstall or uninstall bootloader, backup/restore boot settings and more. 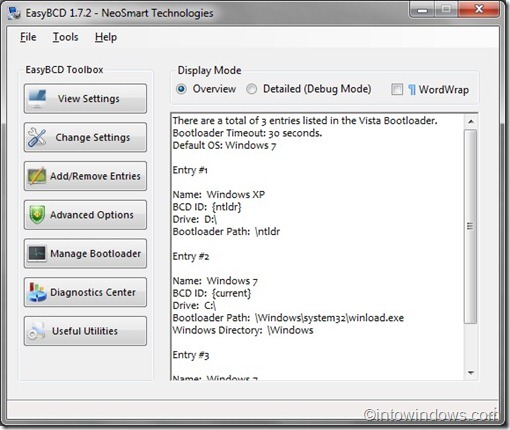 Diagnostics section of EasyBCD helps you find your Windows 7 boot problems either by recreating missing/deleted boot files or by resetting BCD storage. It can also check your boot drive for corruption, and copy debug info to clipboard. As this is an advanced tool, we recommend you create a system restore point before tweaking boot options. Another cool feature is that you can even use this tool to create bootable Windows 7 or Windows 8 USB drive and add startup repair options to Windows boot menu. Overall, it’s a fantastic piece of software to tweak, repair and backup boot settings. It’s one our all time favorite software. Please note that EasyBCD is free for personal use only. 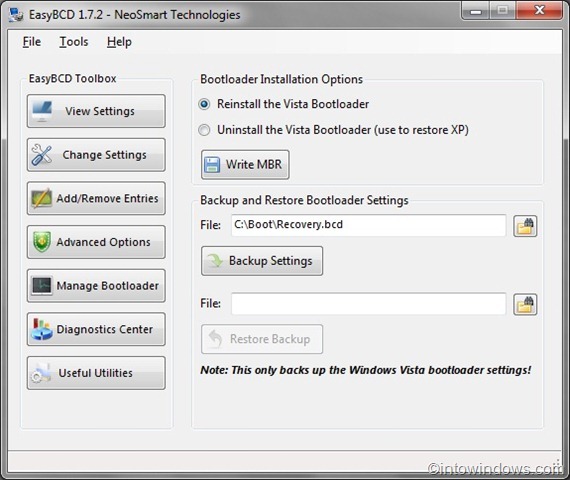 Visual BCD Editor is another free software out there to tweak boot settings. Can EasyBCD be used to boot into either Windows 7 or XP when they are on separate Hard Disks? Had Xp and installed Win 7 64Bit. Works fine. I´d like to have a clone of Win7 on another HDD in case of crash of first Win7. Backup and Restore with Macrium. Add a new entry with easyBCD. The third entry is on Boot and selectable. Windows comes up, the running bar is shown then the pointer flash on a clear screen and after some the system restarts with no further information. Hi, I have a problem: I have been happily running Windows and Ubuntu on my laptop in separate partitions with dual boot. But in installing Windows 7 after my XP had crashed a friend wiped the Grub and now I can’t access my Ubuntu partition which contains,apart from anything else, my diary written over several years. I’ve seen your EasyBCD how to, but it looks like I’m in danger of losing my data. What do you think? I have XP installed on the C:\ drive. Later Windows 7 was installed on the E:\ drive. On start-up Windows 7 boots up and no option is given to run XP. Can Easy BCD correct this? We’ve just released EasyBCD 2.0 Final, no more betas! You needn’t use EasyBCD to install and setup Windows 7 triple boot XP, Vista and 7 as you already have installed XP and Vista. Just install Windows 7 and it will automatically setup the boot order. I am currently running XP Home, Vista (64bit) and used Easy BCD when I set up the dual-boot some time ago, which works fine. I now additionally want to add Windows 7 (32bit). Can I use EasyBCD to include this addition so that I have a triple-boot system? If so, do I go through the same procedure as before for dual-boot? I’m the Director of NeoSmart Technologies and the developer of EasyBCD. First, thanks to “Into Windows” for this post. You can auto-hide partitions w/ EasyBCD 2.0 using the NeoGrub module. Just add a NeoGrub entry in EasyBCD, then configure its menu.lst to hide partition x then chainload the bootloader. Can you put the autohide partition in the next release, please? I can’t think of a way to automatically hide a partition while booting into other. You can do it manually. Yes, I can confirmed that the latest beta do work fine on both Windows x86 and x64; but how do you auto hide the other partition (B) if you boot into say, partiton A and hide partition A when booting into partition B. It does work on Windows 7 64-bit. If you have problems with the current version (which was designed for Vista), you can download the latest beta version for Windows 7 from the EasyBCD forums (check the download link, requires free registration). Having said that, the current version of Easy BCD working fine on my Windows 7 Ultimate 64-bit. EasyBCD doesn’t support windows 7 64bit and Ubuntu 9.10 64bit. As Ubuntu now has Grub2 (grub-pc). Can you give some guidance, if I’m wrong. Thank you for prompt reply; I’ve also found the EasyBCD 2.0 Beta forum. It supports both x86 and x64. Can easy BCD support both x86 and x64 windows 7 on the same HDD with different partitions? How? You are right, Mayur. It’s not supported officially, but works fine on Windows 7. BCD Edit doesn’t support 7 and is not updated since April 2008. But it worked on Windows 7 when I tried it. Thanks Robert for the input. But in our test, EasyBCD 1.7.2 worked fine with all the assigned tasks. I am not sure about on VM, though. EasyBCD 1.7.2 doesn’t properly support Windows 7. Also it doesn’t support vhd entries yet either on 2.0 Beta build 63. At least not on my test VM where I tested that.